What absolute impertinence! Just who does she think she is? A virtuoso? There I was performing What A Wonderful World with virtuoso violinist Ian Cooper and for a few brief moments, the world really was wonderful. Wonderful but I must confess that I was actually playing along to a CD. Moreover, I could only manage a couple of very precious notes. That didn’t matter. I was in seventh heaven. I might have been a legend in my own lunchbox but I didn’t care. I was living the dream, even if I was only nibbling away at the very edges of the crust. You see, even playing these few, very precious notes was a real turning point for me. My violin and I have been experiencing something of a lover’s tiff lately. I had been practicing so hard and yet I just kept making mistakes. I wasn’t getting anywhere and to make matters worse, everyone around me was really flourishing and it felt like I was rapidly being left behind. My teacher has been very encouraging and I’ve looked back to appreciate how far I’ve come but there’s still been that frustration. That sinking sense of despair. Last year, I was really encouraged by the idea that it took 10,000 hours of practice to become a concert violinist. That if I do indeed practice, practice, practice, I’ll eventually get there even if I’m in a nursing home by that point. However, the way I’ve been playing lately, I’ve been starting to wonder whether the magic 10,000 hours of practice would actually make any difference. Am I going to be stuck at this point forever never getting any better? Soon, I found myself accelerating down that dreadful, downward spiral. We can’t be good at everything. Yet, when I started playing the violin, I thought I’d found a missing part of myself. That there was a violin buried somewhere deep inside my heart, within my soul. We were bound together, inter-connected…one. 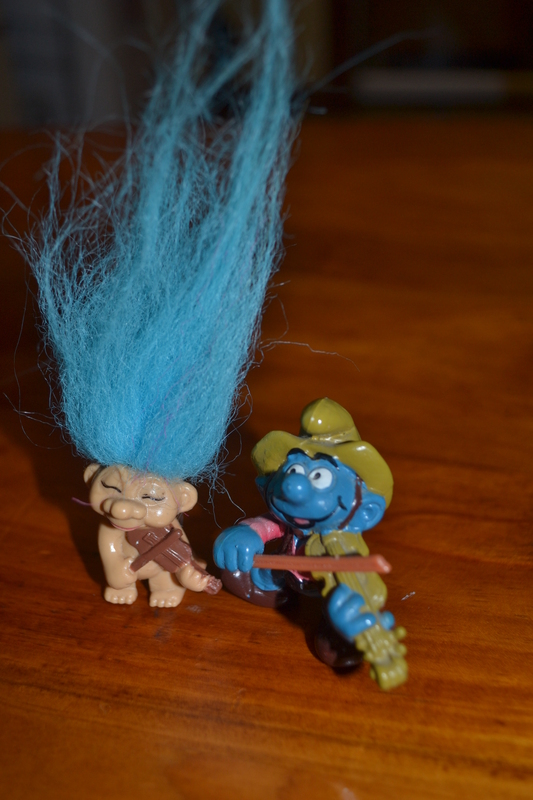 An unlikely duo…the Troll and Smurf Ensemble. 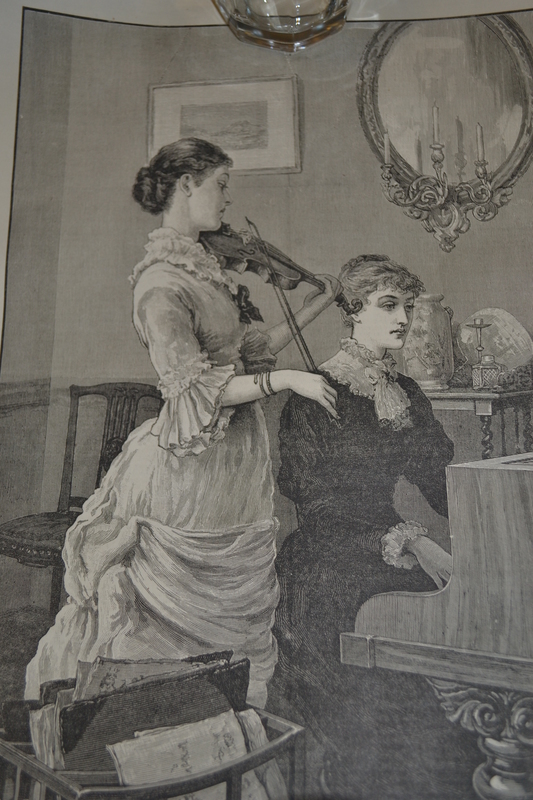 This etching appeared in the London Illustrated News January 6, 1883. I love my violin so much that I’ve even been buying what I call “violin miscellania” on eBay. I’ve managed to find a smurf and even a little troll who are playing the violin. I’ve also bought some ornate 19th century etchings. 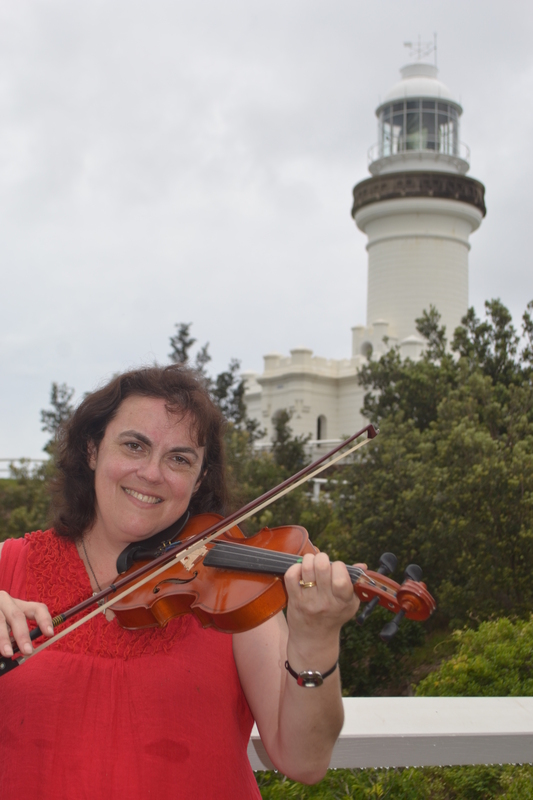 Moreover, I’ve photographed my violin and I even had Geoff take photos of me playing my violin (actually pretending to play) in front of the Byron Bay Lighthouse. I looked quite the professional although I was a bundle of paralyzed nerves when someone asked me if I was going to play. As you can see, I love my violin!! So if I am that passionate about the violin, how could I ever let it go? Give it up without a fight? Surely, I couldn’t get it that sense of connection wrong but now it was starting to strain, rip and tear, I wasn’t so sure. It takes two to tango and as much as I loved my violin, I wasn’t too sure about its feelings for me. I was getting a lot of mixed, if not downright negative signals and I could feel the relationship straining. We were ripping and tearing apart. After all my hard work and many, many hours of practice and all the love that I’d poured into that ungrateful instrument, was this it? Was it over? Were we actually breaking up? I simply wasn’t good enough. Surely, not?!! I still had a bit of fight left. If only I tried a little bit harder, I could get there. I persevered and I persevered but there was no big breakthrough. Actually, it’s all been rather heartbreaking. I might be a grown up and all but I still just wanted to cry. I know learning the violin isn’t like cooking 2 minute noodles. You just can’t add water. Chuck it in the microwave. Hey presto! You’re up on stage at the Sydney Opera House. Besides, water and microwaves do very nasty things to unsuspecting violins…almost as good as a match. Yes, I know it takes at least 10,000 hours of practice to succeed. I also understand that the violin is a notoriously difficult instrument to learn, particularly at first. It is soul destroying when my violin squeaks like a mouse being strangled. I hate it when I keep bumping strings, playing two strings at once. Worse still, it drives me completely nuts when I’m trying to play two strings at once doing double stops and I can’t do it. Why is it that when I want to play two strings, I can only play one and when I want to play one I seem to play two? This instrument is doing my head in. I must also confess that I haven’t quite been keeping up with my practice lately. Last year, I was routinely practising for about an hour a day (You have to practice hard when you pick up an instrument at 42 instead of age 4. That’s many, many hours of practice I have to catch up on!!) Yet, it just hasn’t been coming together and I must confess that I’ve been watching The Voice lately and have been just a little distracted. So I confess. Yes, I haven’t been practice, practice, practicing after all. I’ve slacked off. Perhaps, that could indeed explain my stagnation. Anyway, on Sunday my daughter and I went to a fabulous local concert featuring concert pianist Simon Tedeschi and virtuoso violinist Ian Cooper. I thought long and hard before inviting Miss along to the concert. She’s only just turned seven and the concert went for two hours but she loves music and the tickets were very affordable. You see the concert was held at a local nursing home and was part of the Musica Viva series sponsored by Lend Lease. It was also a very relaxed environment for Miss’s first formal concert. Ian Cooper made a captivating host throwing in comical snippets about his musical travels overseas (encounters with gypsies on the continent and meeting a group of Irish fiddlers sinking Guiness and then playing with them in an Irish pub). The elderly lady next to me was singing along not so quietly to some of the Gershwin numbers and my daughter was struggling to get her iPod to work and was reading her rainbow fairy novel towards the end. The audience clapped along at times and there was even a bit of movement in the seats. After all, how can you possibly sit still when you are experiencing such amazing music? No! You have to respond! It is hard to think about adjectives to describe these magnificent musicians. I am just an incredibly humble, beginner violinist and I learned the piano way too many moons ago. James Morrison, who has to be the undisputed King of Jazz in Australia and beyond, wrote: “Putting Tedeschi and Cooper together is like mixing nitro with glycerine-an explosion of musical virtuosity”. They played an incredible range of music from classical Bach through to jazz, Irish jigs and Gypsy music. I can’t really comment much on the piano side of things. However, I was watching Ian Cooper very closely, astounded as his fingers danced on the strings performing absolute magic. I have been playing for 18 months now and still find fourth finger challenging. Ian’s fingers moved well up the fingerboard, which for me, is such a long, long way from home. It’s like flying a rocket to the moon when you’re only on your learner’s permit. I must also say that Ian exceeded all of my wildest expectations when he announced that he wasn’t just going to play 2 strings at once but all four and he pulled his bow apart and wrapped the horsehair around the strings and actually played beautiful music. I was absolutely gobsmacked!! Anyway, despite my vows of being more frugal, I burst through the door at interval heading for the CD sales. Before I knew it, I was handing over all my spending money for the week and had bought 3 CDs. This is fairly extreme behavior on my part because I only own a handful of CDs but I had to have them. I had to take this performance home and immerse myself in all that lush, beautiful music. Seize the moment forever! Anyway, there I was on Monday morning listening to Ian Cooper playing What A Wonderful World of Louis Armstrong fame, when I reached for my violin and started to pick out a few notes and played along. A humble beginner, I was now playing with Ian. Well, I have to admit it was only a couple of notes because Ian sort of wove this magic that transformed this piece of music into something I can’t describe. Suffice to say that it was way too brilliant for this little beginner. All the same, I really did enjoy our “duet”. It was absolutely awesome! A real hoot!! I was definitely laughing on the inside…especially after all my violin battles lately. I felt that maybe…just maybe…my violin was starting to like me again. Yes, Ian Cooper might be a very distant star. A star in a some far off galaxy. Yet, I’m on my way a few notes at a time and it’s quite okay to be a legend in your own lunchbox after all. I encourage you to visit Simon Tedeschi’s website www.simontedeschi.com where you can listen to a few teasers and read some of his articles or visit Ian Cooper at www.iancooper.com Better yet, try to see them live in concert together. They really were a sensation! Yes, it really is a wonderful world. 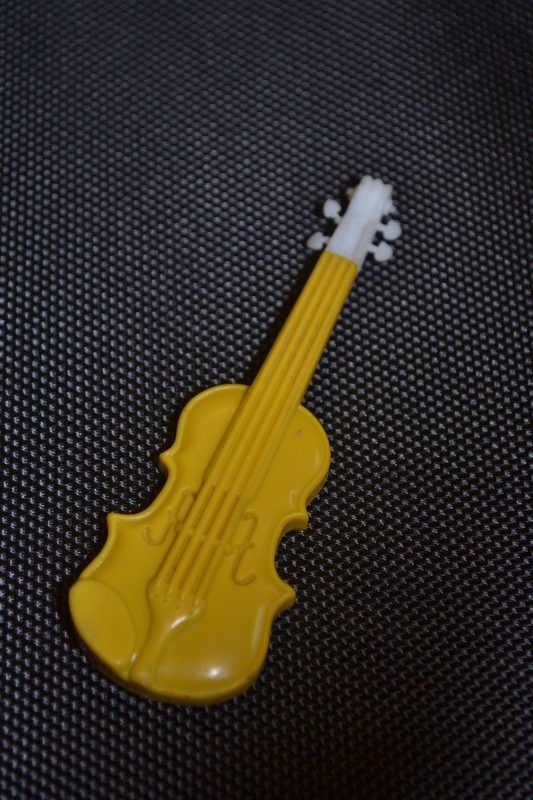 1960’s melamine pencil lead holder from my violin collection. This entry was posted in Uncategorized, Violin and tagged A Wonderful World, Brentwood Village, Byron Bay, Central Coast, Ian Cooper, James Morrison, Jazz, Louis Armstrong, love, music, Musica Viva, piano, Simon Tedeschi, violin on May 23, 2013 by Rowena. Mister made this card for my Mum.